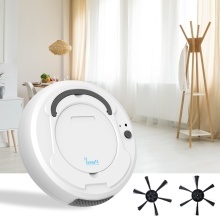 This is a 3 in 1 mutifuntional sweeping machine, offers 360° seamless cleaning. Sweep, suction and drag, make your space cleaner and more comfortable, free your hands from heavy housework. Super long 150 minute working time with built-in powerful battery, easily work in 150㎡ space. It will be your best helper. 3in1 mutifuntional sweeping machine, offers 360° seamless cleaning. Sweep: bilateral six-sides claw brushes with a wide rotating sweeping range and for more powerfully gathered. Suction: high-efficiency 1800PA suction is stronger, easy to deal with all kinds of garbage stains. Drag: a large rag at the button close to the ground, can effectively remove water stains and small dust. Automatically change direction when meet walls and obstacles, and pause at the brink with anti-drop detection sensor. 65mm ultra-thin, easy to get the bottom of the bed, sofa and other dead corners with a larger cleaning coverage. Super long 150 minute working timr with built-in powerful battery, easily work in 150㎡ space. Noiseless, very quiet during normal working time, and the sound is below 40 DB. Suitable for cleaning flat ground such as marble, tile, wooden floor, etc. 1. Switch mode: Press the host switch, and the sweeper enters the working mode working lamp to light up. Press the host switch again and turn off the sweeper. 2. Charging mode: Connect the Micro USB head of the USB cable to the charging port of the sweeper and connect the USB head to the converter for charging. 3. Charge Status: The charging indicator light is on, indicating that the charging is being charged and the OFF indicates that the charging is complete and the general charging time is about 2-3 hours. For safety reasons, this product should be operated by people with physical and mental health and over 14 years of age. This product is not waterproof, do not let the product contact any liquid and shallow water, keep away from the source of fire. It is forbidden to use in the suspended environment, such as rooftop, staircase, duplex house and so on. Please allow 1-3centimetres differs due to manual measurement.